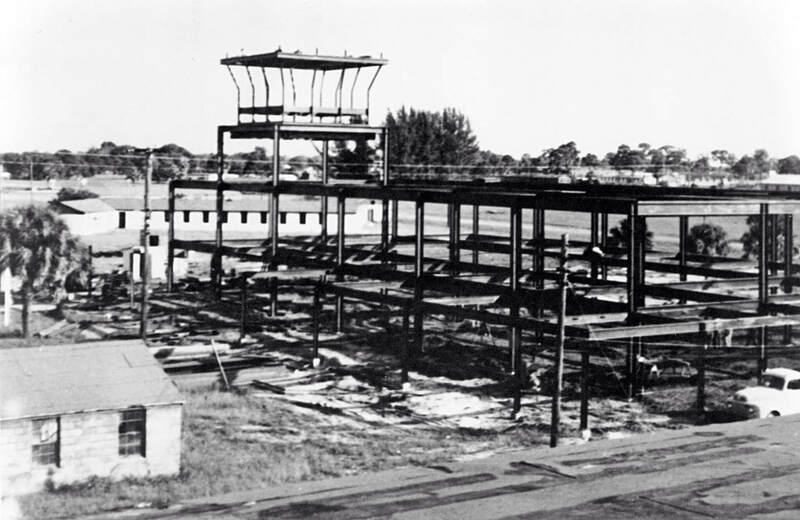 Sarasota's first municipal airport, Lowe Field, opened March 12, 1929. The 120 acre field consisted of two turf runways, a 2,640' east-west strip and a 1,980' north-south strip. 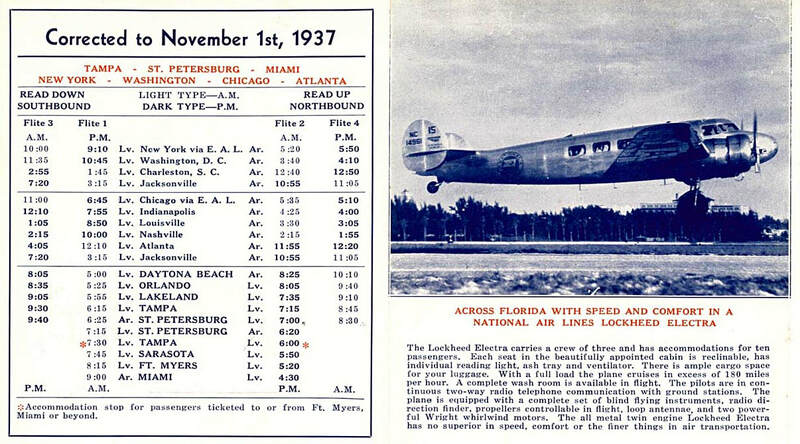 National Airlines began service to Sarasota on August 4, 1937 using 10-passenger Lockheed L-10 Electras. The following detail from National's November 1, 1937 timetable shows two daily flights: "Flite 1" southbound to Ft. Myers and Miami and "Flite 2" northbound to Daytona Beach with connecting flights to New York and Chicago via Eastern Air Lines. Timetable image courtesy of Björn Larsson . The same timetable features descriptions of several Florida destinations including this one about Sarasota. 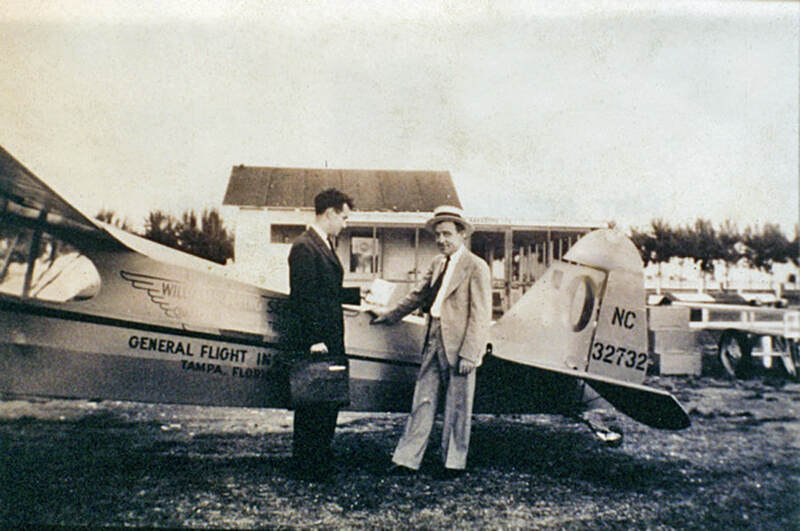 This photo from the Florida Archives shows travel agent Fred Francke (right, wearing hat) and another man with a Piper Cub used for flight instruction. 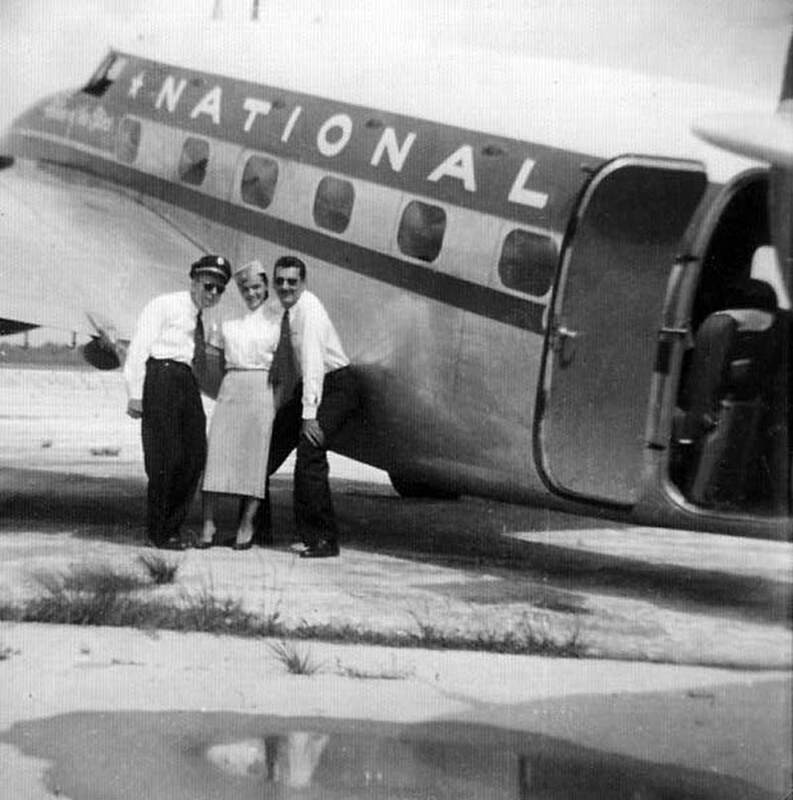 Behind them is National Airlines' terminal at Lowe Field which was located along what is now North Beneva Road, between 12th Street and Fruitville Road. Just beyond the trees in this photo is the winter headquarters of the Ringling Brothers Circus. A quick look at Google maps reveals that the location of this scene is now a Publix parking lot. Sarasota's short unpaved runways left no margin for error and take offs and landings were potentially hazardous in hot or rainy conditions. As National began to replace the Lockheed L-10 Electras with larger Lockheed Lodestars, it became apparent that Lowe Field was not suitable for airline operations. This highlighted detail from National's December 1, 1941 schedule shows that service to Sarasota had been "temporarily suspended pending completion of airport improvements." Timetable image courtesy of Björn Larsson . 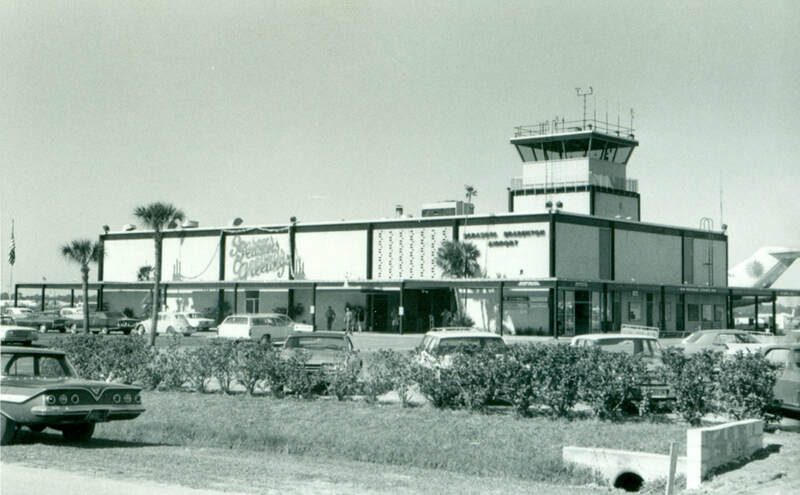 With the assistance of a Federal WPA-CCA grant, Sarasota Bradenton Airport was completed in 1942 at a cost of approximately $1 million. The airport was leased to the Army Air Corps as a training base during World War II and the federal government expanded the field and spent millions of dollars on improvements between 1942 and 1945. The entire base was turned back over to civilian use by 1947. 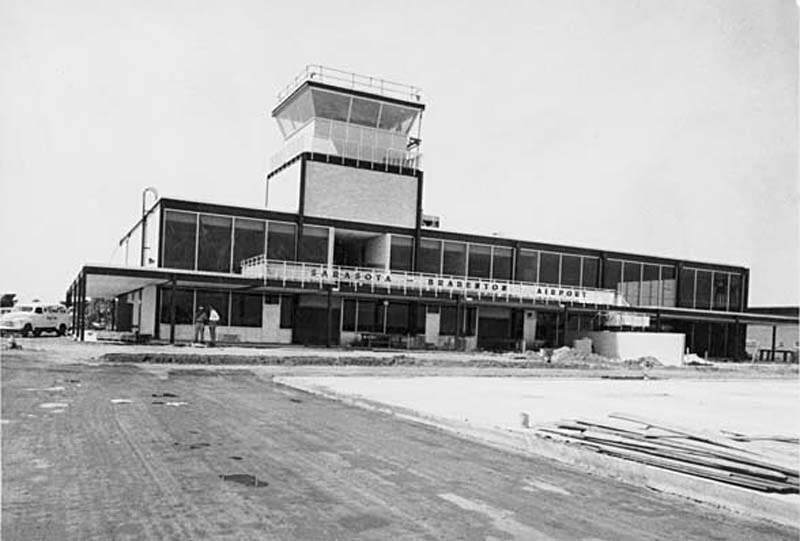 Construction of a modern new terminal that could handle jet aircraft began on August 18, 1958. The cinder block buildings seen here were the remains of the WWII Army air base. 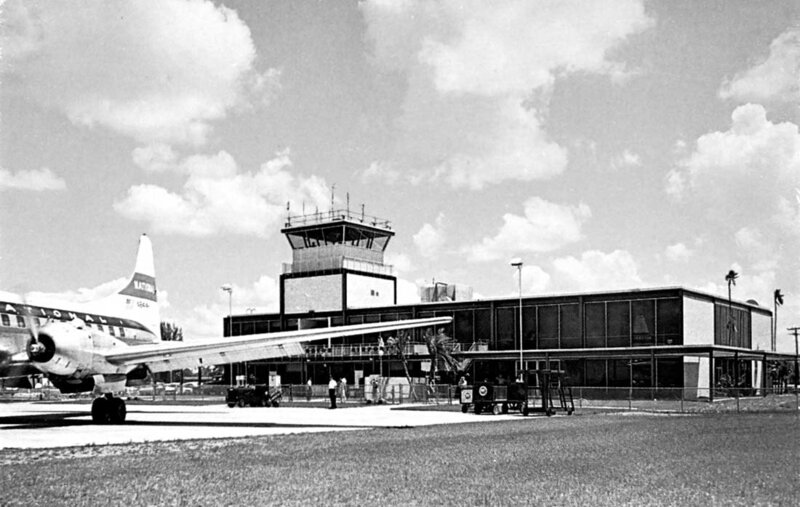 Sarasota Bradenton's modern new terminal opened on June 1, 1959 and featured a control tower, office space, large ticketing area, gift shop, coffee shop and a balcony where visitors could watch aircraft. 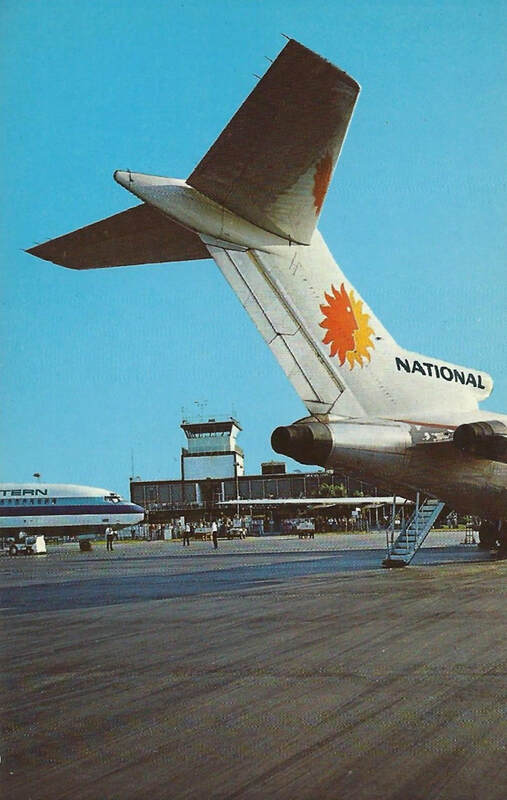 This postcard view shows a National Airlines Convair 340 on the ramp. The 1959 issue of the Civil Aeronautics Board publication "Airport Activity Statistics of Certificated Air Carriers" shows that National boarded 22,616 passengers on 2,124 departing flights at Sarasota Bradenton in 1959 using a mixed fleet of Convair 340s, Douglas DC-6s, DC-7s, and turboprop Lockheed L-188 Electras. 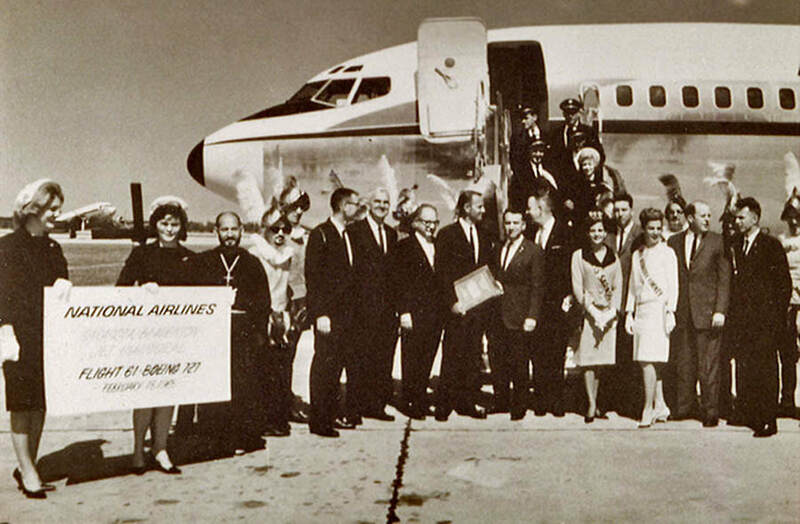 Eastern Air Lines began flying to Sarasota in January 1961. 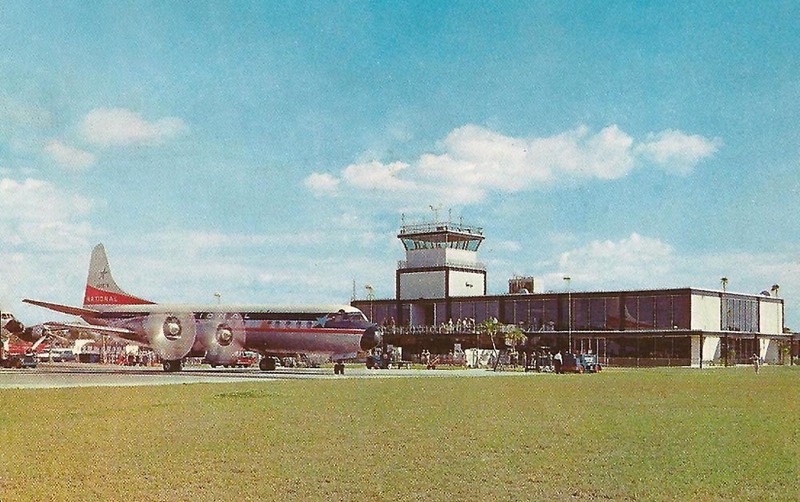 This early 1960s postcard view shows the final glory days of the "propliner" era with a National Airlines Lockheed L-188 Electra and Eastern Air Lines Lockheed Constellation at the terminal. This photo also shows how rapidly the airlines were outgrowing the new terminal with the aircraft barely able to squeeze onto the small ramp. Note the departing Electra's nose wheel is only feet from the grass. The ramp was expanded soon after. 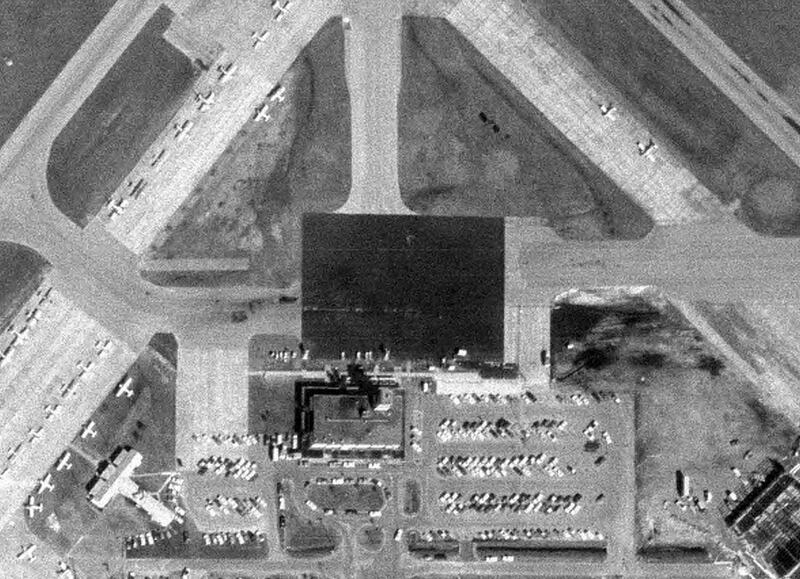 Aerial view of the terminal area on March 28, 1962. The Skyview Dining Room and Cove Cocktail Lounge, located on the second floor of the terminal, offered great views of the boarding ramp and runways. An Eastern Convair 440 can be seen through the dining room window in this early 1960s postcard view. Another early-1960s postcard view, apparently taken from the exact same spot and on the same day as the above photo, judging from the cars. A National Lockheed Electra is visible just to the right of the terminal. Courtesy of Shea Oakley. 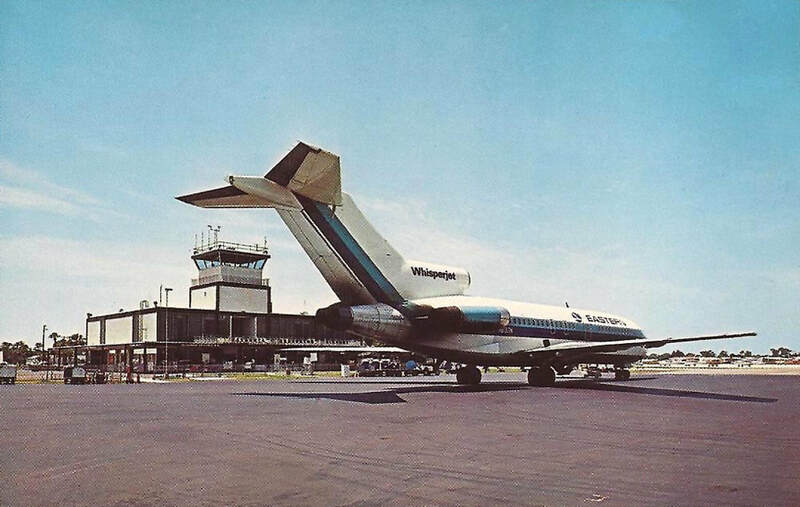 A circa 1967 postcard view of an Eastern Air Lines Boeing 727 "Whisperjet". 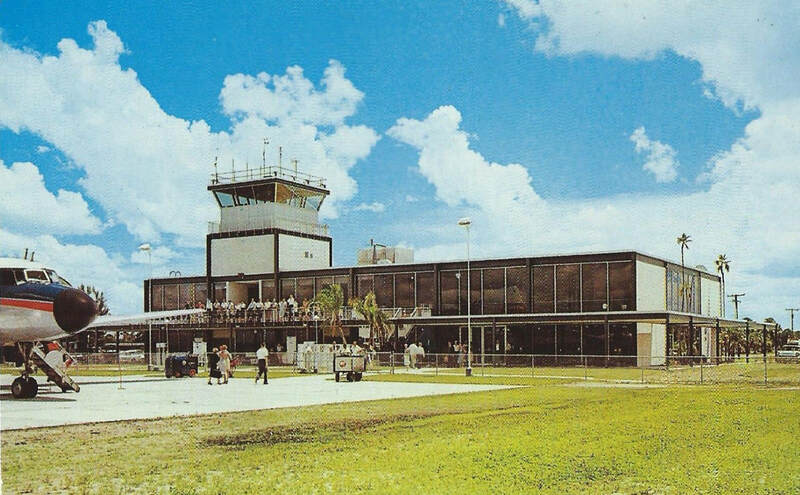 Late 1960s postcard of Sarasota Bradenton Airport. The Sarasota Bradenton terminal adorned in Christmas decorations. Courtesy of Shea Oakley. 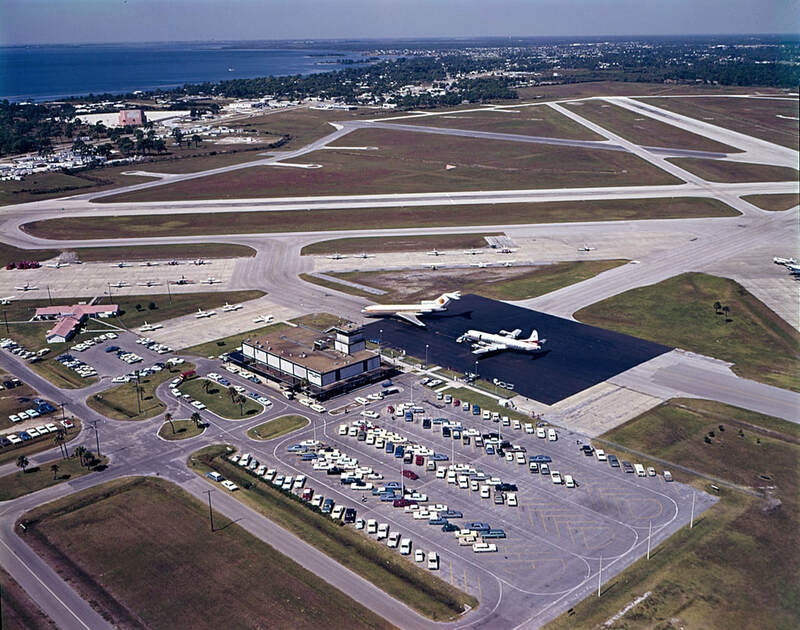 Along with major trunk airlines National and Eastern, two commuter airlines also served Sarasota Bradenton in the 1960s. 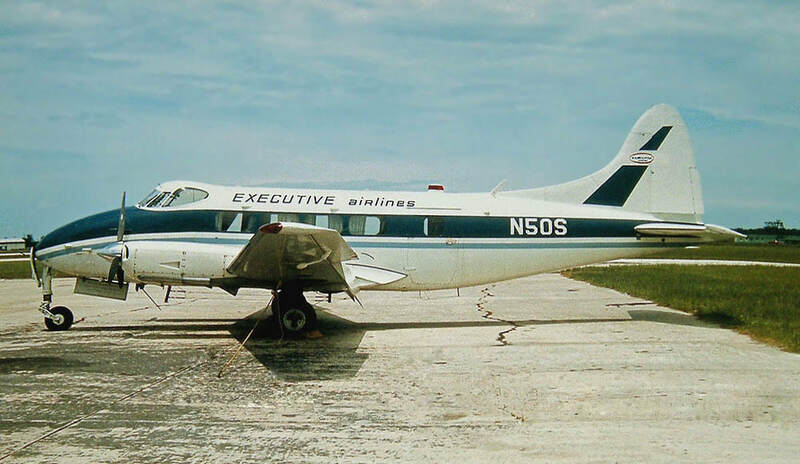 New England commuter carrier Executive Airlines opened a southern division on December 1, 1964 and established its regional offices and maintenance base at Sarasota Bradenton. 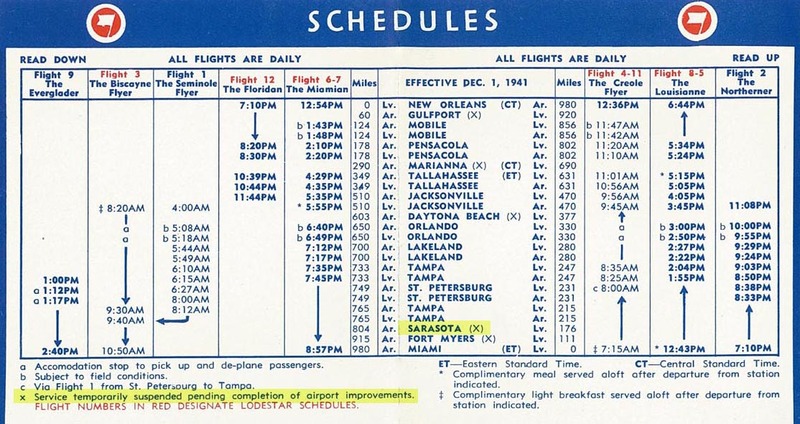 This December 1, 1968 timetable shows an average of 19 daily departures from Sarasota with non-stops to Tampa and Fort Myers and direct flights across Florida. 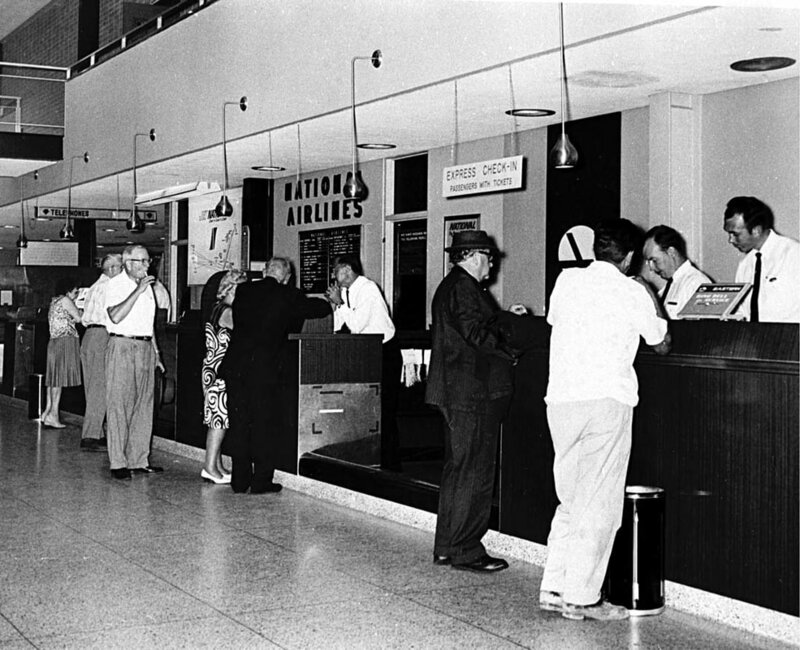 Florida Air Lines began scheduled flights between Sarasota and Tampa in 1968. 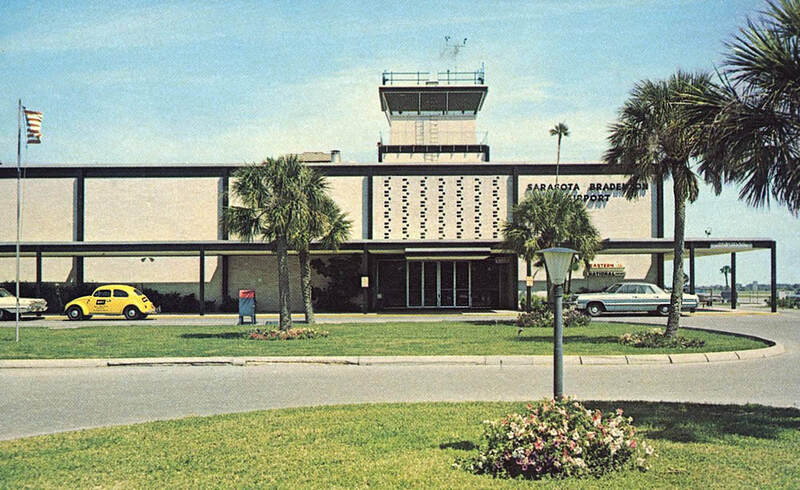 The airline moved its headquarters to Sarasota in the mid 1970s. Executive Airlines de Havilland DH.104 Dove N50S pictured at Sarasota Bradenton in 1969. 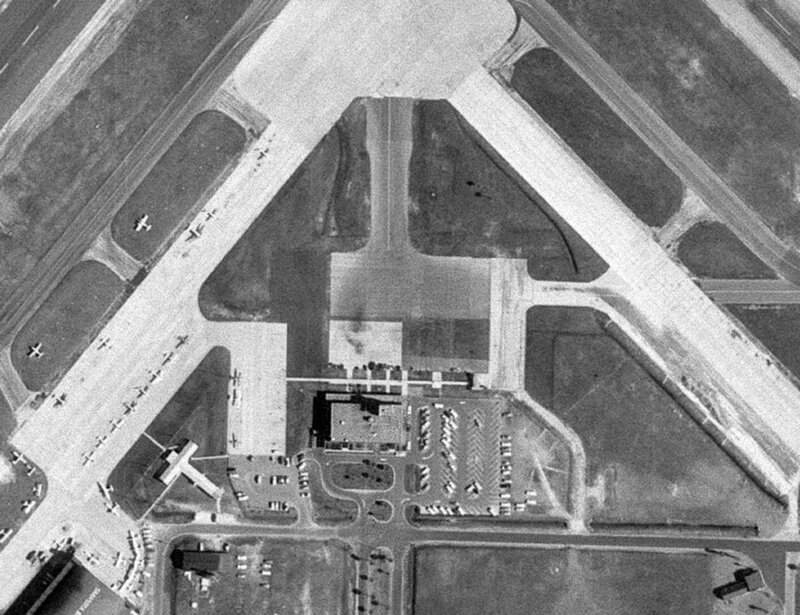 This aerial photo from January 13, 1969 shows a taxiway added to the west side of the ramp, allowing jets to taxi straight out from their parking positions. 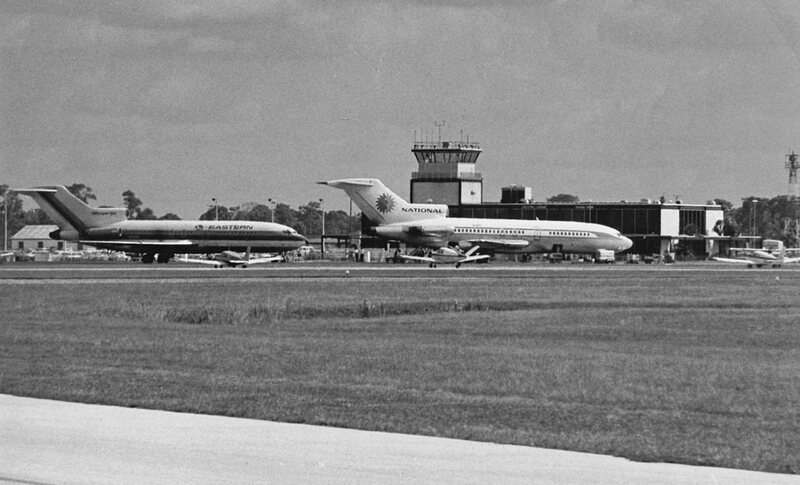 An overview of the terminal area circa 1968 shows two National aircraft on the ramp. 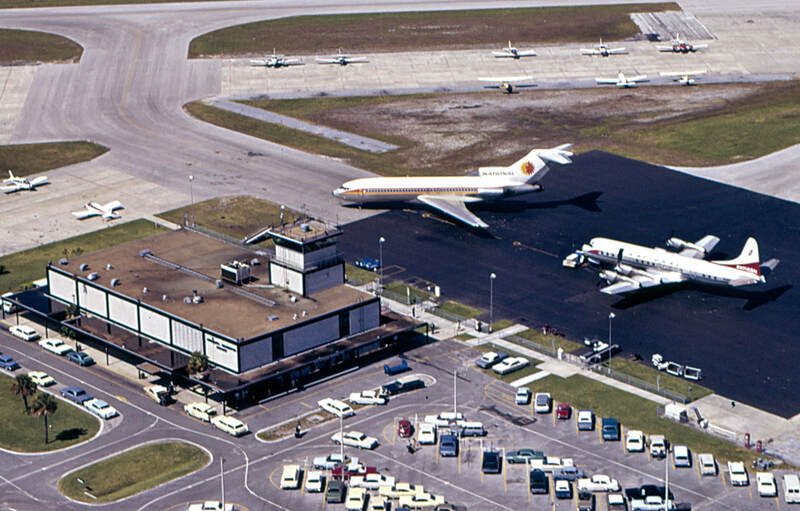 Photo from the Sarasota-Manatee Airport Authority archives via Shea Oakley. Here's a closer view of the above photo showing a National 727-100 in the new "Sun King" paint scheme and a Lockheed L-188 Electra turboprop at the terminal. 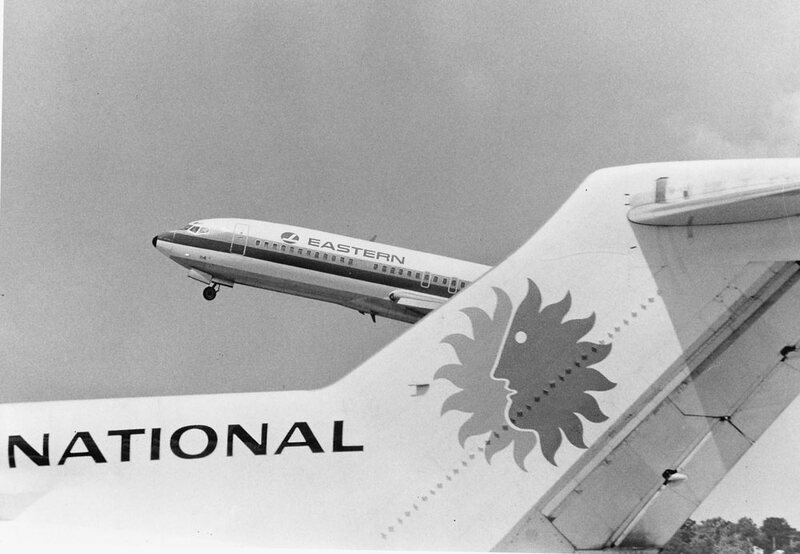 National became one of the first "all jet airlines" when the Electras were retired in 1968. This really illustrates the small size of the old terminal. 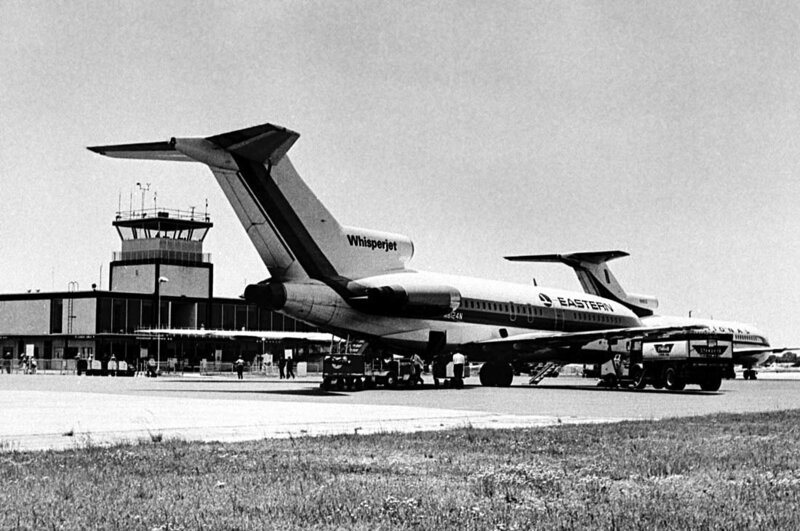 Eastern and National 727-100s at the terminal circa 1968. Photo courtesy of Shea Oakley. 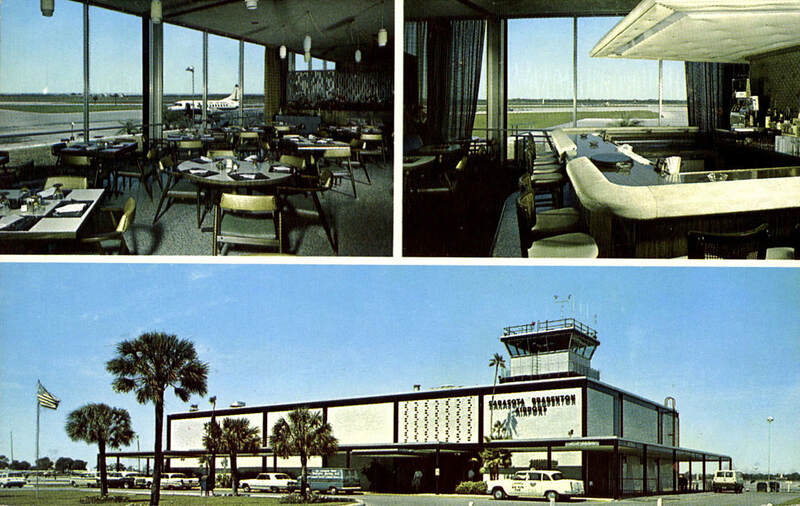 A nice study of Sarasota's two major airlines in 1968. Courtesy of Shea Oakley. 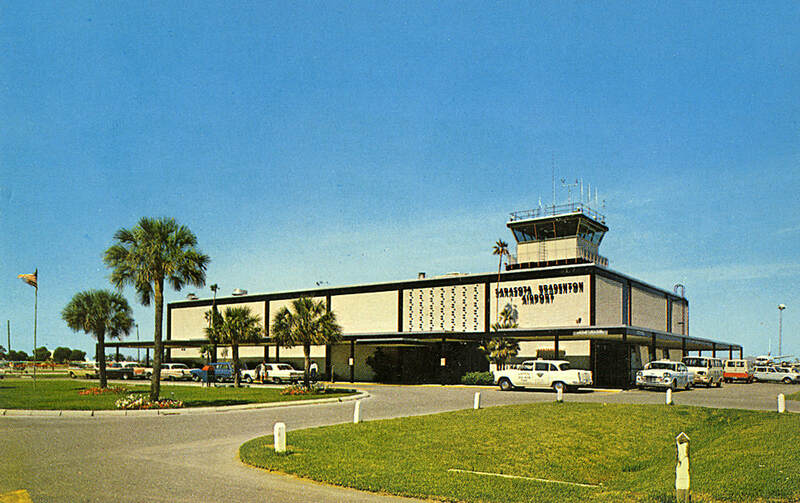 A fantastic late 1960s postcard view of Sarasota Bradenton Airport dominated by the Sun King tail of a National 727.